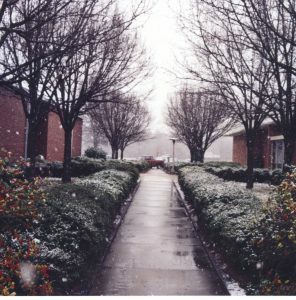 The path between the Learning Resource Center and Wilkinson Hall on the Lee county main campus of Central Carolina Technical Institute in the snow. A new batch of photographs from Central Carolina Community College is now available on DigitalNC. These photographs range in date from the 1960s through the 1990s and focus mainly on campus facilities. 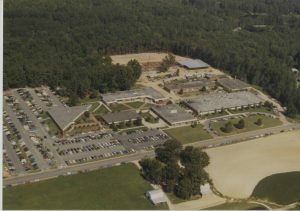 CCCC was started as Lee County Industrial Education Center in the early 1960s, but underwent name changes in 1965, 1979, and 1988 to become Central Carolina Technical Institute, then Central Carolina Technical College, and finally Central Carolina Community College. These photographs follow the school through periods of growth and change and document how campus looked through all of these stages. Particularly striking is a collection of aerial photographs that shows CCCC’s Lee County Campus from above. This new batch of photographs joins previously digitized photos from CCCC that focus on student life and academic programs. To see more materials from our partner Central Carolina Community College, visit their DigitalNC partner page or take a look at their website.